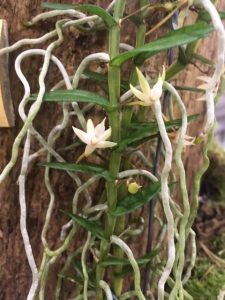 Another of the interesting species on our display is this unusual little species found in riverine forests in Kenya, Tanzania, Uganda and Zambia from 1300-2350m altitude and so is a coolish growing species adapted for a relatively dry but humid environment. We grow the species in Cool Americas (Min 12C) hanging on a long wire hook attached to the twig it once lived on! 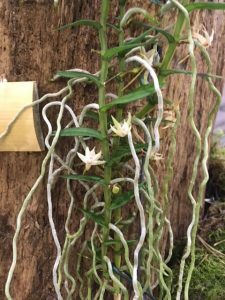 The plant lives up to its name and grows vertically with masses of roots and pretty little flowers along the climbing stem. It seems quite happy growing up its wire and it will be interesting to see how far it will grow.